Tinea spiniella Hübner, 1807. Stett. Ent. Zeit. 32: 67. Leaf-miner: The short full depth corridor mine is made in the leaf in September and the larva then hibernates on the axil of the leaf, making a web and feeding the next spring (British leafminers). 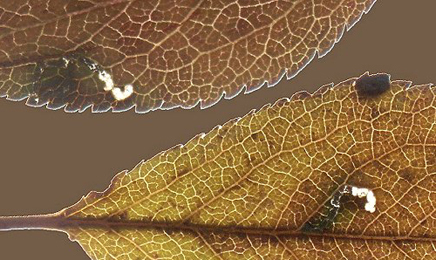 In the spring they feed on the leaves from within a silk web (UKMoths). The larvae make a small full depth corridor in autumn. They pass the winter in a hiberaculum outside the mine, later they live free in a spinning (Bladmineerders van Europa). Free-living larva- Body slender, reddish brown; head light brown; prothoracic plate dark brown. Laterally a bright white, broad but to the rear quickly narrowing length line on thorax of foremost abdomen segments. A similar dorsal line, but narrower and shorter, begins behind the head (Bladmineerders van Europa). Pupation on a twig in a cocoon (British leafminers). Time of year - larvae: September - June (British leafminers). Time of year - adults: The adults can be found on the wing in July and are attracted to light (UKMoths). Distribution in Great Britain and Ireland: Throughout England, Wales and southern Scotland (UKMoths) including Anglesey, Bedfordshire, Breconshire, Caernarvonshire, Cambridgeshire, Carmarthenshire, Cumberland, Derbyshire, Dorset, Durham, East Cornwall, East Kent, East Norfolk, East Suffolk, Flintshire, Glamorgan, Hertfordshire, Huntingdonshire, Isle of Wight, Kirkudbrightshire, Leicestershire, Middlesex, North Hampshire, North Northumberland, North Somerset, North Wiltshire, Pembrokeshire, Shropshire, South Devon, South Lancashire, South Northumberland, South Somerset, South Wiltshire, Stafford, Surrey, West Cornwall, West Gloucestershire, West Lancashire, West Norfolk, West Suffolk and Westmorland (NBN Atlas) and the Channel Is. Also recorded in Republic of Ireland and Northern Ireland (Karsholt and van Nieukerken in Fauna Europaea). See NDBC interactive map. Distribution elsewhere: Widespread in continental Europe including Albania, Austria, Belgium, Bulgaria, Corsica, Czech Republic, Danish mainland, Estonia, Finland, French mainland, Greek mainland, Italian mainland, Luxembourg, Norwegian mainland, Poland, Romania, Sardinia, Slovakia, Spanish mainland, Sweden, Switzerland and The Netherlands (Karsholt and van Nieukerken in Fauna Europaea).